A fight between majority and opposition erupted in the Georgian parliament over plans to support the Ukrainian opposition for European integration. 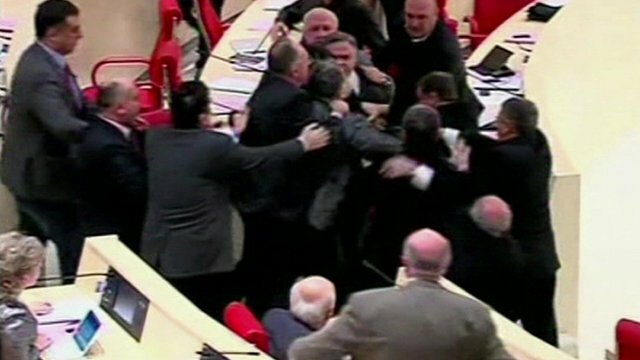 Video footage taken inside the Georgian parliament shows deputies throwing documents in the air and brawling with one another following the opposition’s suggestions. Opposition deputy Giorgi Baramidze wanted to encourage supporters of Ukraine’s European integration with a special resolution. Giorgi Baramidze also condemned violence inflicted on participants of peaceful rallies in Kiev. No one was seriously injured in the incident, but opposition representatives have demanded a public apology from the parliamentary majority before they will participate in any more plenary meetings.